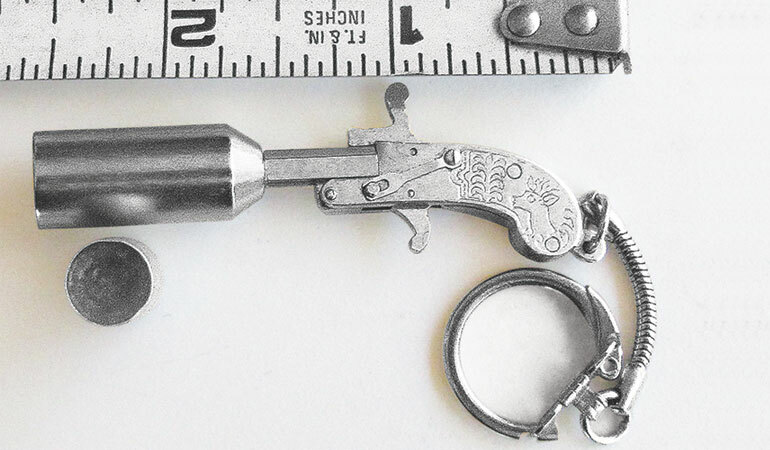 A 2mm pinfire with a working flare cartridge and a key chain. 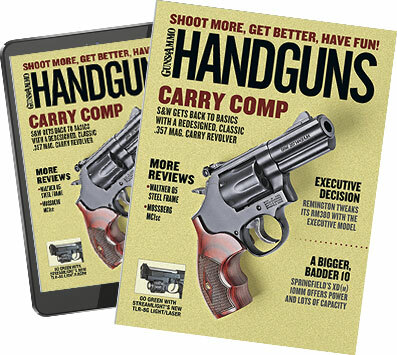 Pinfires and some other handguns come in small sizes, typically measuring about an inch in length and weighing less than an ounce. One that is hard to beat is the 2mm pinfire. Some fire a projectile at a listed 1,000 fps, producing a single foot-pound of energy. The projectile size is about the same as a small shotgun pellet. While very anemic, it could injure someone if shot in the eye, so respect is needed. I saw a 2mm being fired at a soda can at one foot, and it dented it deeply but did not fully penetrate. Still, I for one would not want to get shot in the eye with it. A keychain was a common way of carrying them. That way they were inconspicuous and handy to get ahold of in an emergency. By federal law, it doesn’t seem to be a problem obtaining a pinfire, as they are considered antiques or signaling devices and not firearms. However, in states like New Jersey, for instance, you need a permit to carry or own such a gun. There may be other states that have similar restrictions, so if in doubt, consult with a lawyer who is familiar with pin guns and the laws regarding them. There are sites that sell the 2mm pinfires, some resembling well-known guns such as the 1911 and the Broomhandle Mauser. Some are quite expensive because a lot of work is required to make a working model, and some are quite novel as well. I saw a 2mm pinfire that has a pocket watch with a Studebaker on the watch. They seem to be popular in Japan and Austria, and a lot of them are made there. A couple of websites offer pinfire ammo. In addition, kits are available to those who roll their own. From experience, it is a time-consuming project, especially with the smaller calibers.